Metal pellet trap with 5 circles, that get up when touched by the pellets. They simply return down pulling the string provided. 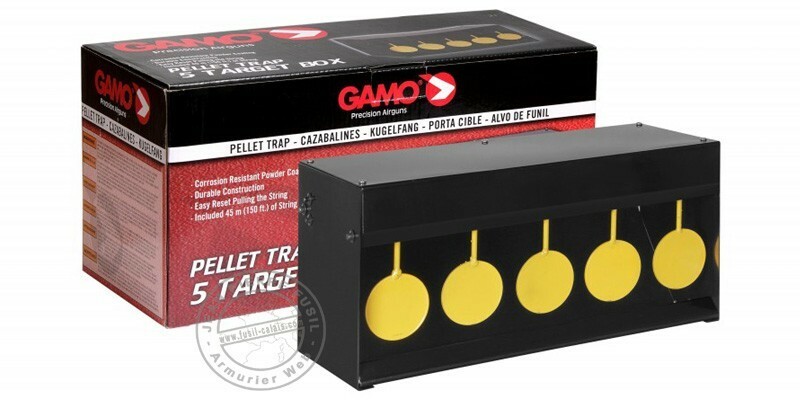 Metal box with 5 round targets that rotate on impact with the pellet. Magnetized, they stay up, disappearing from the sight. They can be liberated at any moment, pulling the 45 meters string provided. This pellet trap recovers the pellet, avoiding to let them anywhere. It can be put or fixed on a wall. Metal construction, corrosion resistan coated.